The solid brass nuts on the VERITAS bench bolts slide into a pre-drilled hole in the stretcher, and distribute pressure to prevent breakout. A bench can be made very rigid (without complex joinery) by using a wide stretcher, since the stretcher is bolted into position. 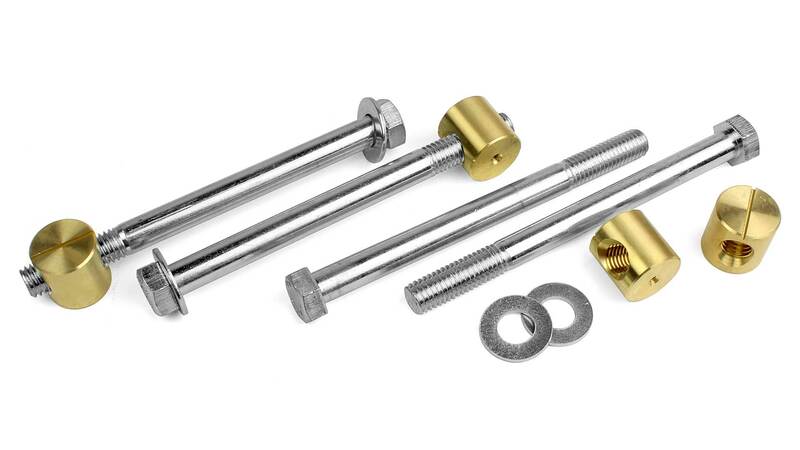 The steel bolts are 152 mm long and 12.7 mm in diameter. The nuts are 25 mm x 25 mm and are made for a 25.4 mm hole. They also fit in a 25 mm hole as the nuts are slightly undersized. Thread is 1/2 x 13 UNC.